I picked this book up for three reasons: 1) I've seen people talking about it for a while and I was curious. 2) The series is called Slow Burn which implies...a slow burn. And 3) The B&TB vibes paired with the fact that a friend called Jax a grumpy hero and I am a total sucker for a grumpy beast hero. So I gave this one a shot and overall, I'm glad I did--I really liked it! The novel is full of tropes done well. Enemies to lovers and marriage of convenience, along with aspects of Beauty & the Beast to keep things extra fun. I loved the progression of Jax & Bianca's story, and I especially loved their chemistry. They were clearly a well suited pair and I enjoyed seeing them realize that fact--and grow to accept it...and embrace it. Bianca and Jax were great leads, in their own ways. Bianca is stubborn and sassy and I had so much fun reading her. Jax was grumpy, but he also had a soft side I adored seeing shine through. And together? As I said, their chemistry was amazing. And their SWEETNESS. Yes, please. I just wish there were more Jax chapters--I'd have liked even more from his POV! 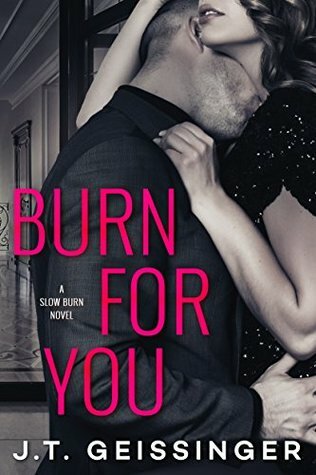 Burn for You was a quick read and I was solidly entertained the entire time, but there are a couple of things I wasn't particularly fond of too. First of all, the recipes scattered throughout the book. I have nothing against recipes, but the way they were dispersed in the middle of the story didn't work for me. I get they were meant to coincide with particular parts, and I enjoyed turning the last page and seeing THAT one, but for the most part they took me out of the story. I'd flip a page and it'd be a recipe instead of the next scene and I'd be like "oh." So I just wish they'd been together at the end of the book with maybe an annotation to them for anyone who wants them as they read. Second of all, while I enjoyed the story I didn't feel as invested as I could have been--as I'd hoped I would be. I think the pacing could have been better to build and really deepen certain aspects. Like Jax and his parents, for example. And the ending. I wanted MORE, but it was kind of surface level in a way. 3.5 stars - A sweet, fun enemies to lovers & marriage of convenience romance!